The monument is in the North end of Hagerstown in the City of Hagerstown park known as Mealey Parkway and is clearly visible day and night from Potomac Avenue. The monument design as well as being in a beautiful setting allows for thoughtful meditation. Ample curbside-parking is available. Dedicated June 23, 2013, the Korean War Veterans Monument was constructed by Antietam Chapter 312 as a permanent reminder of the sacrifices made by Korean War veterans and as a permanent tribute to those who served in the United States Armed Forces during the Korean War period, June 25, 1950 to January 31, 1955. The monument especially honors the 32 Washington County residents killed during hostilities in Korea. Annually on 27 July, Antietam Chapter 312 holds a public event to commemorate the Korean War Truce Agreement (signed July 27, 1953) with formal remembrance services at the Korean War Veterans Monument site. 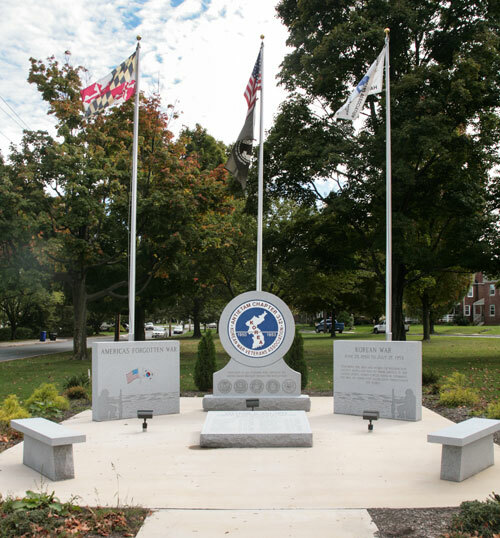 On select National Holidays (May 30, June 14, July 4, November 11), the Korean War Veterans Monument site is decorated with small flags around the perimeter and when appropriate for the holiday, memorial wreaths are placed near the Heroes Name Tablet. The monument is a tribute to all veterans who served in that war. The 32 local veterans who lost their lives in Korea are as follows. (Read details about each brave man who died serving our country). Antietam Chapter 312 and the City of Hagerstown maintain the Korean War Veterans Monument site. Thank a Veteran and please make a donation to maintain the Monument. Make check (identify for "Monument Fund") payable to: Antietam 312 KWVA.